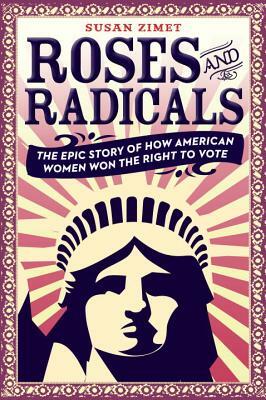 Roses and Radicals: The Epic Story of How American Women Won the Right to Vote (Hardcover) | novel. Susan Zimet has dedicated her professional life to key public policy issues such as the environment and women's rights by serving as the executive director of the Hunger Action Network of New York State, the President of Zimet Group, Inc., and the President of 2020: Project Women, Inc. Roses and Radicals is her first book for young readers and she lives in New Paltz, New York, with her family. "My mother said, 'Struggle is a never ending process. Freedom is never really won, you earn it and win it in every generation.' Roses and Radicals is a must read about the history of the suffragist movement in America-the oppression of women-and the good, the bad, and the ugly relating to their struggle for the right to vote. It is not just a book for women, but for everyone, especially future generations because when we don't know our history, we may sadly repeat it." "From Elizabeth Cady Stanton to Alice Paul and every crucial suffragist in between, Susan Zimet's Roses and Radicals offers a comprehensive and compelling account of a truly collective victory more than seventy years in the making. Zimet unpacks all of the intricacies of the suffrage movement, never shying away from its flaws, turbulent partnerships, and differing dogmas. For those tempted to label it an important book for young girls, think more broadly; it is an important book for all of us." "The brave women and men who fought so hard for women's right to vote show us how to be brave when we need it the most. Which is always. Roses and Radicals is a must read for all kids and citizens!" “Roses and Radicals isn't just the story of women's journey to suffrage, it's completing history and how a few bold women made America fulfill its promise of democracy. Charming and full of detail, the book is like eavesdropping on friends from another era.